Veterinary Diagnostics can be defined as the tests that help in determining and identifying various disorders in animals. These procedures are performed via various methods that utilize their blood, faeces and tissue samples. Globally, an increasing awareness towards animal health and increasing trends of animal insurance are expected to be the key growth drivers for the veterinary diagnostics market during the period of study. Geographically, North America dominated the veterinary diagnostics market driven by world class veterinary diagnostics infrastructure, awareness amongst citizens for animal healthcare and presence of key players in the region. North America was followed by Europe and Asia-Pacific as second and third largest market for veterinary diagnostics market. Asia Pacific is projected to have the fastest growth, owing to a rapidly developing veterinary diagnostics infrastructure, increasing awareness on animal healthcare in developing nations such as China and India in this region. 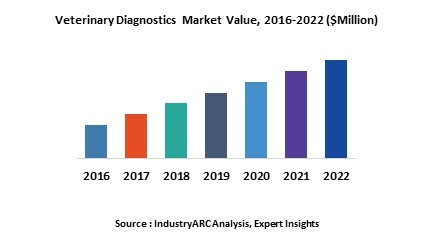 This report identifies the veterinary diagnostics market size for the years 2014-2016, and forecast of the same till the year 2022. It also highlights the market drivers, restraints, growth indicators, challenges, and other key aspects with respect to the veterinary diagnostics market.